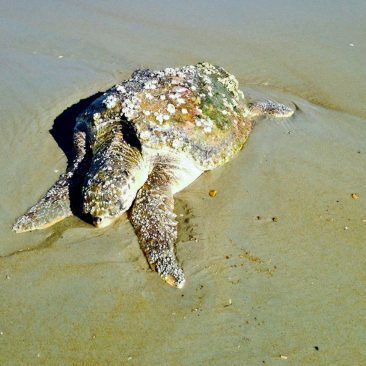 Sea turtle nesting on the beaches of the Outer Banks got off to a very slow start in Summer 2015. The ocean water temperature was way too cold for a cold-blooded animal like the sea turtle. We began patrolling at dawn on 1 May 2015; we found only a live Minke whale and two live, stranded loggerheads during the entire first month of patrolling. Things got more interesting in June. 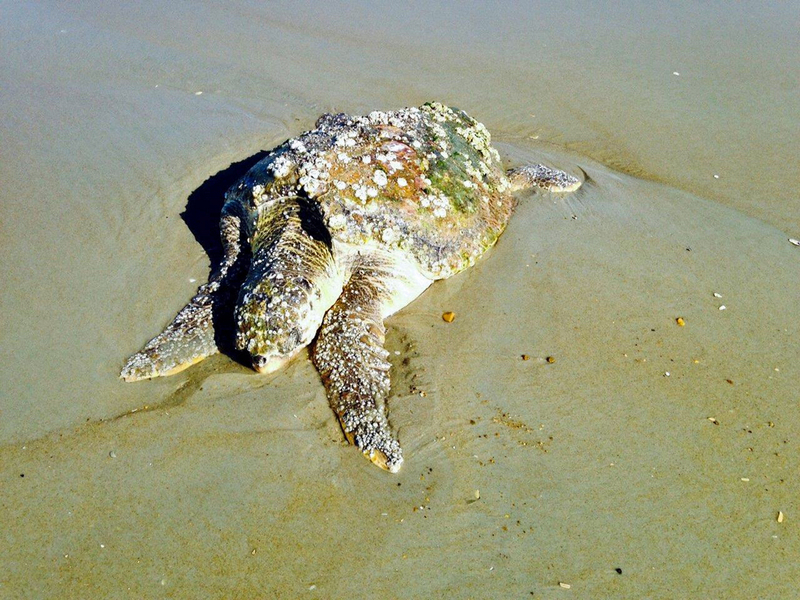 At 8:00PM on 6 June, the NEST (Network for Endangered Sea Turtles) hotline received a phone call reporting an injured loggerhead sea turtle on the beach. 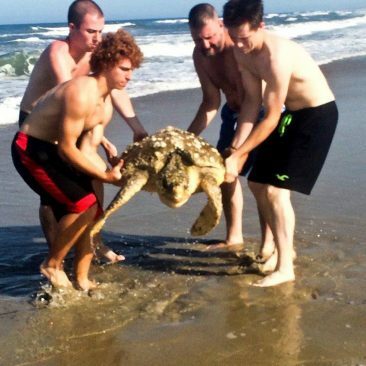 Using only flashlights, the NEST volunteers could not find the turtle and so assumed it had returned to the sea. 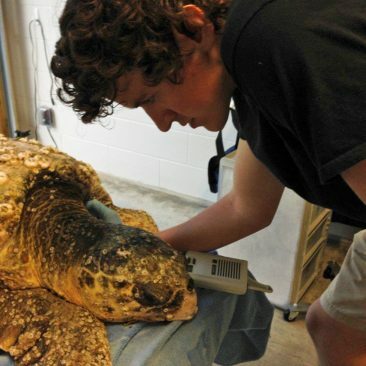 At 4:00PM the next day, though, the hotline again received a call about an injured loggerhead at the surf line. Concerned visitors helped move the turtle out of the surf. Due to her large size (130 pounds), we had to wait for assistance from the lifeguards to transport her in a vehicle off the beach. 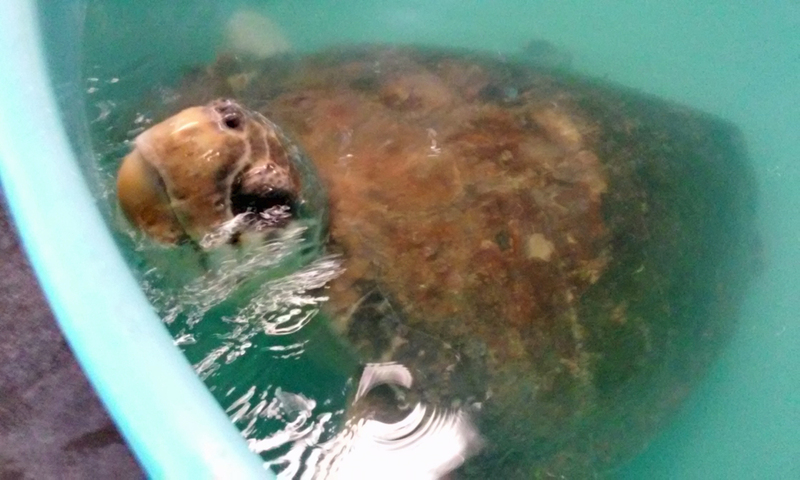 The loggerhead was taken to the North Carolina Aquarium on Roanoke Island for rehabilitation at the new STARS (Sea Turtle Assistance and Rehabilitation) Center. We could tell that the turtle was a female because she was an adult and had a short tail. A full-grown male loggerhead has a long tail. She was extremely lethargic when she arrived at the rehab center. 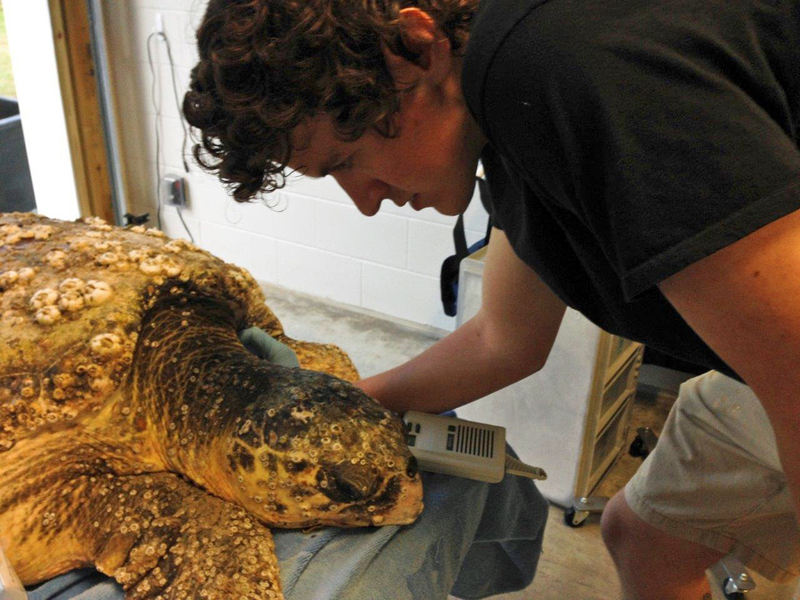 Mark (assistant aquarist) and Kenneth (rehab technician) placed her on a gurney and immediately began evaluating her. The following day we received the great news that she was responding well and, best of all, that she was eating well, which is unusual so soon after arriving at the center in such a debilitated state. We are grateful to all of the visitors, lifeguards and NEST volunteers whose immediate action for this endangered species has made her rehabilitation possible. Thank you for all of your compassion and assistance. Her name is Crest and we are encouraged that she is riding the crest of a wave to a full recovery. She is still doing well but she needs to gain at least 40 pounds before she can be released. She is being fed capelin, a long silvery fish. It doesn’t have much nutritional value. If and when the STARS Center gets sardines, she will get them. She gets a calcium tablet and a megavitamin every other day. 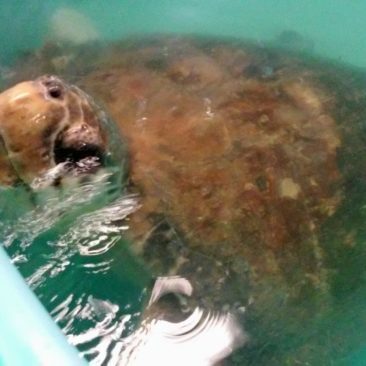 We will continue to update you on her recovery and eventual release back to the sea. UPDATE: 10 AUGUST 2015: Crest is gaining weight. She now weighs 138.5 pounds. Her target weight is 152 pounds. She is eating sardines and vitamins, and three days a week she receives one calcium tablet and 1/2 of an iron tablet. 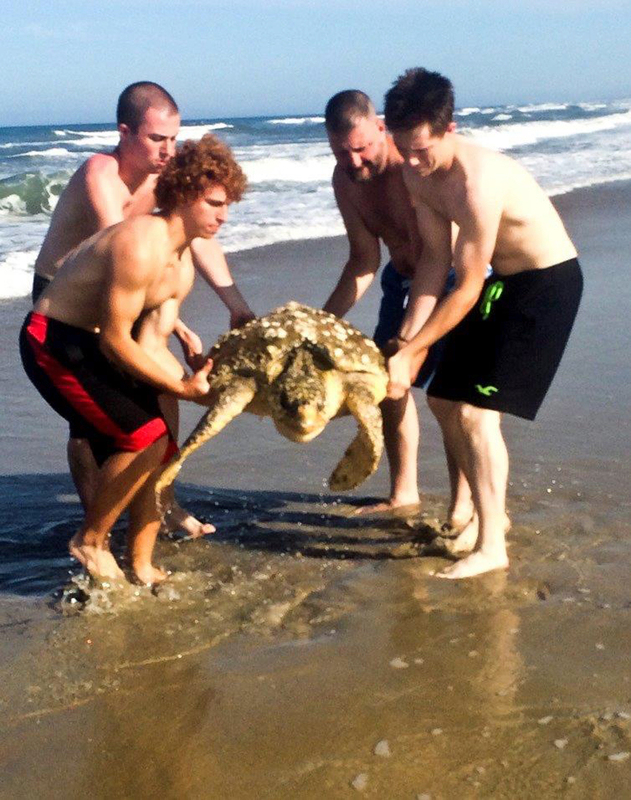 UPDATE: Crest was successfully rehabilitated and returned to the open ocean. Please see Crest Rehabbed, Returned to Open Ocean for more information.